In August 1969 I was almost fourteen and getting ready to start high school, so there was an undercurrent of angst roiling up within to keep me on edge. Girls and music were on every horizon. I suffered through severe cases of puppy-love with any girl who smiled at me or even looked my way. The news coverage of Woodstock had tweaked my interest in hippy fervor, so I was a wannabe flower child on the lookout for all things anti-establishment. CHOW, the local radio station that was constantly tuned in at our house, had a country format so there was no rock‘n’roll to keep me stirred up. The strains of fiddles and steel guitars were always in the air. Johnny Cash was already legendary. My Dad and Grandpa liked him, so in a flash of youthful independence and rebellion, I’d decided that he was a loser. That view was about to abruptly change. A song was climbing up the Billboard Country charts that’d grab hold of me. I first heard it on a jukebox at a hotdog and ice cream joint called Grand Island, which was weird because it was not an island and there was nothing grand about it. A cool summer evening was fading into night with the colors of twilight spreading across the darkening sky. Two adults were feeding quarters into the slot and making selections; they wondered if the jukebox contained the uncensored version of A Boy Named Sue. Uncensored version? My ears perked up. I stayed close and waited. Any song that had to be censored must be good. I was not disappointed. The rhythm and cadence of the lyrics instantly captured my imagination, and then there was the long beep covering over the bad words. A tingle tickled my spine and I smiled. 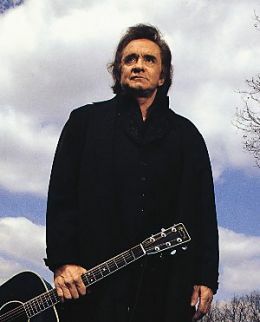 I had discovered Big John Cash for myself; there was something dangerous and radical about the man. Not long afterwards, I was standing in front of a rack of albums at Woolworth’s, fixated on the blue cover of JOHNNY CASH AT SAN QUENTIN. I couldn’t scrounge the money to buy it then, but in a few years it would be mine. The rest, as they say, is history. His music was destined to be integrated into my life. 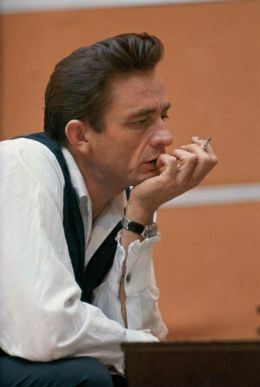 Johnny Cash is the only one ever to be inducted into the Songwriters Hall of Fame, the Country Music Hall of Fame, the Rock & Roll Hall of Fame, the Rockabilly Hall of Fame, and My Personal Hall of Fame. Cash was a friend to everyone. He transcended genres and made connections that vastly expanded cultural perspectives. He could be performing on stage at a Billy Graham crusade one week, and then, a few days later he’d be hanging out with Bob Dylan or Neil Young or some other figure from the counterculture. He bridged generational gaps and musical styles like no one before or since. When it came to music he refused to be boxed in by boundaries set by others. Consider this gem from October 28, 1970. Johnny Cash was perhaps the most public Christian of the twentieth-century. He was no saint, nor did he pretend to be; he carried himself with an authenticity that was attractive. His triumphs and failures were always in the spotlight for all to see. He understood the truth of the human condition so well. In 1994 he released an album called American Recordings. The album cover artwork was interesting for it featured a picture of two dogs. One dog was black with a white stripe, while the other dog was white with a black stripe. 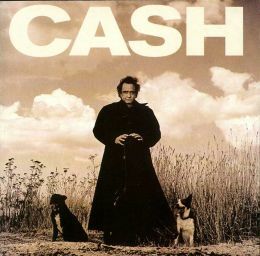 The photograph of the two dogs was meant to say something about Johnny Cash. Left completely alone sin would reign supreme as we relentlessly devised new ways to perpetuate evil. The black stripe of sin weaves its way into every public and private arena of our life together on this small planet. Sin is humanity’s curse. Redemption is our blessing. The good news is that humanity has not been abandoned to our own devices. Our Creator has made provision for us, fashioning the path of redemption in the shape of a cross. Sin, redemption, love, grace; the essence of life. Big John Cash comprehended it as well as anyone, and enriched the world by sharing it all in songs from the depths of his heart.